This week’s choice for a Romanian song goes hand in hand with the rainy weather in Romania at the moment, and it comes from a group that have been performing for the last 30 years, somehow managing to re-invent themselves with each new album. The band Holograf just released the song ‘Cat de departe’ (How far, in translation), from the new album Love Affair. The ballad from Holograf has quite a simple melody line and straight forward, yet powerful words in Romanian, one of the few songs released recently by a local band in their native language. The video for the song – you can watch it below- was filmed on a couple of streets in the beautiful Old Town of the capital Bucharest, and it shows the band members, all in their 50s, interfering with different love scenes on their path. The younger actors from a popular teenage series in Romania these days, called ‘Pariu cu viata’ (Bet with life) are characters in the love stories presented from different angles in the video. Holograf were one of the first rock bands in Romania of the late 70s – early 80s. 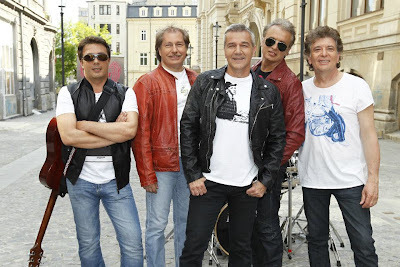 With 12 albums and a slightly different lineup, but with the same lead vocal Dan Bittman since 1985 (also the anchor of a show on the TVR public station), the band seem to stay fresh and to go beyond their initial fan base from the communist era. Another one of their recent songs below (Nu mai e timp – There’s no time), features opera singer Angela Gheorghiu.